Rainy days are ahead on Jupiter's most intriguing moon. We’ve known about Europa since Galileo discovered it in 1610. It was only in the 1960s, however, that this icy satellite orbiting Jupiter caught our attention and curiosity. Ever since the first detailed views of Europa’s surface were taken, astronomers identified its surface as mostly frozen water. Astronomers believe that, underneath all that ice, lies a vast subterranean ocean, containing twice the amount of water as Earth’s oceans. New images from NASA’s Hubble Space Telescope seem to confirm these assumptions. 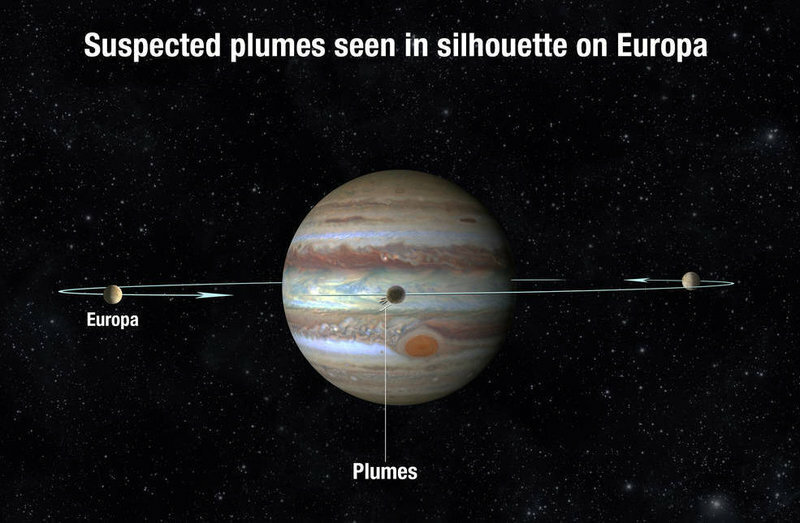 Scientists studied Europa’s silhouette as it moved across Jupiter, and almost stretching the limits of Hubble, they saw what may potentially be plumes of water coming out of the icy moon’s surface. They looked again using ultraviolet light for signs of plumes over a period of 15 months. On three separate occasions, they identified the potential plumes. These plumes seem to rise about 200 km (125 miles) from Europa’s surface, and then rain material back down on it. Astronomers and astrobiologists are keen on finding anything that can suggest life in space. Water is one such clue. Several missions are scheduled to confirm these findings. NASA has been ordered by congress to launch a mission to Europa by 2022. On the other side of the Atlantic, the European Space Agency (ESA) has plans for a mission called JUICE or Jupiter Icy Moons Explorer, to survey Europa and two other moons of Jupiter. The team, led by William Sparks of the Space Telescope Science Institute (STScI) released their findings for publication this week in The Astrophysical Journal.